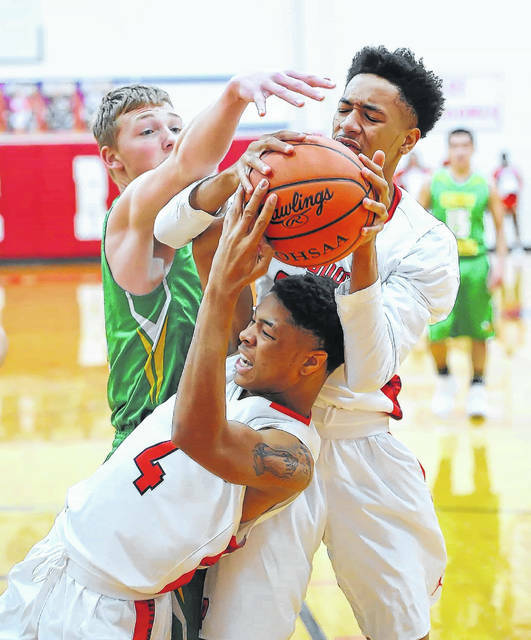 Perry’s Chazz Jackson, center, and Malique Cooper grab a rebound against Cory Rawson’s Eric Ritter during Tuesday night’s game at Perry’s Leonard V. Volbert Gymnasium. See more game photos at LimaScores.com. Perry’s Jamal Whiteside drives against Cory Rawson’s Nathan Zuercher during Tuesday night’s game at Perry’s Leonard V. Volbert Gymnasium. Perry’s Jayden Priddy puts up a shot against Cory Rawson’s Matthew Roth during Tuesday night’s game at Perry’s Leonard V. Volbert Gymnasium. See more photos from the Perry-Cory-Rawson game. 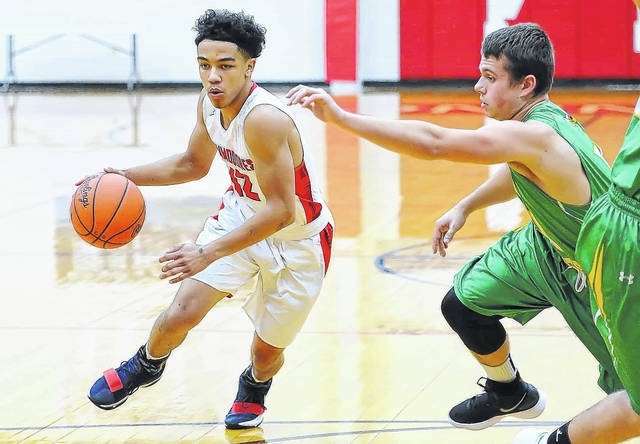 PERRY TOWNSHIP — Perry boys basketball coach Matt Tabler knew this season would be a work in progress. After losing several key players off last year’s state semifinal team, Perry is looking to build some consistency. 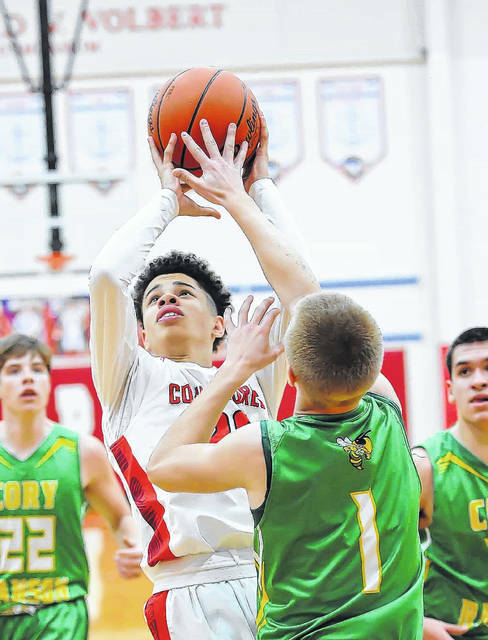 After Tuesday’s thrilling 69-65 double-overtime victory over visiting Cory-Rawson, Tabler feels like his squad has taken the first step. Logan Dray led the Commodores (1-1) with 30 points, including eight 3-pointers. Dray canned six of those long bombs in the first half. Louis Hoersten scored 13 points, including a huge 3-pointer in regulation to push the game into overtime for Perry. Hoersten also came away with seven rebounds and had two blocks for the Commodores. For Cory-Rawson, Eric Ritter led the way with a game-high 35 points. He also pulled down nine boards and made three steals. Dray jump-started the Commodores, draining four 3-pointers in the first eight minutes of action, to help lead Perry to a 21-15 lead by the end of the first quarter. Cory-Rawson took its first lead at the 6:30 mark of the second quarter, 22-21, on an inside move by Ritter. But, Perry came roaring back. Dray connected two more times from behind the 3-point line in the second quarter, and Perry’s defensive pressure held Cory-Rawson to just 4 of 15 shooting from the field in the second stanza. The Commodores went into the break with a 34-26 lead. However, Cory-Rawson cut the deficit to 5, 45-40 by the third stop. Ritter cut it to 47-46 with a 3-pointer in the left corner, just 30 seconds into the fourth quarter. The Hornets then took a 48-47 lead at the 6-minute mark on a tip-in by Ritter off a missed shot. Cory-Rawson kept it close the rest of the way. For the game, Perry shot 44 percent from the floor. The Hornets connected on 40 percent of their field goal attempts.